NAVI MUMBAI, India â€” With an infusion of bling, Bollywood and go-go boots, a new cricket league is trying to spin off Indiaâ€™s colonial inheritance into a money-making symbol of a brash, emerging nation. A new cricket league in India has enlivened a traditional game with laser shows, movie stars and cheerleaders. Whether the Indian Premier League, as it is called, will ultimately succeed in cultivating a loyal fan base at home, challenging cricketâ€™s world order and globalizing the game of the former British Empire remains to be seen. Already, it has upturned many conventions of an erstwhile gentlemanâ€™s game, drawn corporate sponsorships from multinational firms selling everything from cellphones to real estate and, with salaries comparable to the English Premier League of soccer, lured some of the top names in international cricket, including players from Indiaâ€™s traditional rivals, like Australia and even Pakistan. The game itself is a fast and furious brand of cricket called Twenty20 â€” referring to 20 overs per team â€” in which games are played in about three hours. In contrast to the leisurely, ritualistic five-day matches played by men in white, this form of cricket is a loud and powerful display of batsmanship geared to grab eyeballs on prime-time television, and sponsored by Adidas (and Nike and Reebok). â€œLess time, more fun,â€ was the verdict of Harshal Kini, 20, at a Sunday night match pitting the Mumbai Indians against the Deccan Chargers of Hyderabad. Cricket is only part of the spectacle. The 10 matches played so far have featured laser shows and stilt walkers, American-style cheerleaders and plenty of Bollywood stars blowing kisses from the stands. It is a coming of age for both the business of sports in India and for Indian billionaires, who for the first time are staking their prestige on sports teams. The leagueâ€™s most expensive franchise, at nearly $111.9 million, is the Mumbai Indians, fittingly owned by Indiaâ€™s richest man, Mukesh Ambani. The flamboyant liquor baron Vijay Mallya picked up the Bangalore-based Royal Challengers for $111.6 million, and the actor Shah Rukh Khan is backing the Kolkata Knight Riders for $75.09 million. By upending convention, the league has also invited its share of controversy. Cheerleaders, including the squad belonging to the N.F.L.â€™s Washington Redskins, whom Mallya imported for the opening match in mid-April, have been greeted by a mixture of enthusiasm and lewd comments from the stands, and indignation from politicians who have found them obscene and in contravention of Indian tradition. â€œWe live in India, where womanhood is worshipped,â€ said Siddharam Mehetre, a politician in Maharashtra state, where Mumbai and Navi Mumbai are located, according to the Press Trust of India. Local police were on the lookout here at Sundayâ€™s match to see if obscenity laws were being violated. But by then the cheerleaders for the Deccan Chargers, who had worn tartan miniskirts, fishnet stockings and halter tops, were covered in short-sleeve T-shirts and black tights. On the steamy coast of the Arabian Sea, the cheerleaders, who had come from Australia, were drenched in sweat. Later in the week, the Delhi Daredevils took their cheerleaders away altogether. Another embarrassment arose after Harbhajan Singh, the acting captain of the Mumbai Indians and notorious bad boy of Indian cricket, was accused of having slapped S. Sreesanth of Kings XI, who immediately began bawling.The league swiftly fined and barred Singh. One of the most striking things about the new cricket is how patriotism has been scrubbed out of a game. â€œCricket has been the major vehicle for Indian nationalism, of a special and aggressive kind,â€ said Ramachandra Guha, a historian and cricket writer. At a recent night match here, the Mumbai Indians were defeated by the Deccan Chargers, but fans in the packed 55,000-seat stadium kept cheering â€” for the away team, no less, and its star batsman, Adam Gilchrist, an Australian. Jadav said she preferred the cricket that she had grown up watching, where nations play each other. India versus Pakistan, she said, is her favorite. Indeed, the usual passions of cricket have been turned on their head. A few months before Singh was punished, the entire Indian cricket establishment rallied around him when he was accused during a match of lobbing a racial slur at Andrew Symonds, a member of the Australian national team who is black. Symonds plays for the Deccan Chargers and is one of the highest-paid players in the league. The logo of the Mumbai Indians is a ball of fire lifted from Hindu mythology. 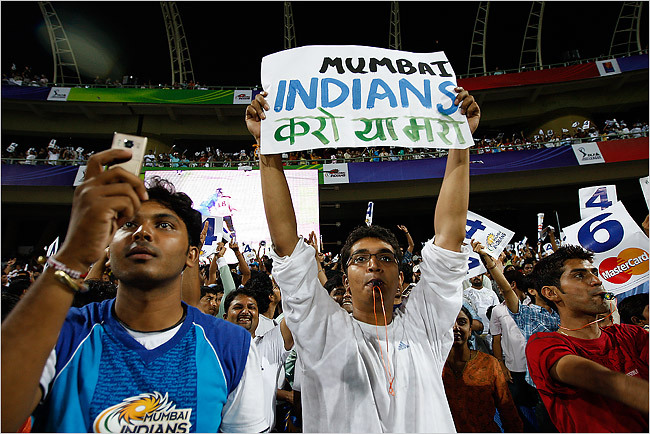 Fans in Mumbai watched the hometown Indians play the Deccan Chargers last week. The real challenge, Guha said, would come if the Indian Premier League cut into the international cricket calendar, forcing established tournaments to rearrange their schedules. â€œWhether youâ€™re now going to see cricket as just entertainment, itâ€™s premature to say,â€ he said. The Indian Premier League was started by the Board of Control for Cricket in India, cricketâ€™s governing body in India, just as a rival effort, the Indian Cricket League, floated a similar international league. So far, the television ratings have surprised even the Premier Leagueâ€™s biggest boosters, who staked their bet on its format, prime-time slot and the star cachet to draw audiences beyond the fans of traditional cricket. â€œItâ€™s a marriage between two major entertainment properties â€” cricket and Bollywood,â€ said Lalit Modi, the chairman of the Premier League, who added that another necessary factor was deep pockets to back each franchise. Will the Premier League make money for the tycoons who have staked their wealth and prestige on the line? Certainly, each team will make money â€” television rights were sold to Sonyâ€™s Indian arm for $1.026 billion â€” but the real profits will pour in if teams perform well and attract more corporate sponsorships. At the game between the Mumbai Indians and the Deccan Chargers, Ambani was in his box with his wife, Nita, and their three children. The whole family wore blue, the team color. Nita Ambani had slapped a Mumbai Indians sticker on the back of her flowing chiffon salwar kameez. The team logo, she pointed out, was a ball of fire, a divine weapon known as a chakra lifted from Hindu mythology. No matter. Mumbai was losing badly. The Ambanisâ€™ children looked ashen. â€œI have to keep reminding myself, itâ€™s only a game,â€ she said. Mukesh Ambani sounded upbeat. â€œWait until the Australians go home,â€ he whispered. â€œThose who win after losing really win,â€ Ambani said. Two days later, Ambaniâ€™s Mumbai Indians beat Khanâ€™s Kolkata Knight Riders. The Indian news media dubbed it the billionaire versus Bollywood.